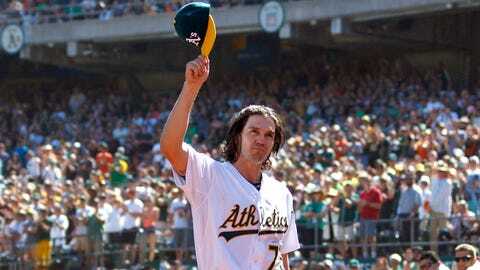 Zito tips his cap after being taken out of his tribute start against former A's teammate Tim Hudson. After one last hurrah, left-hander Barry Zito has officially hung up his cleats. The 37-year-old pitcher announced his retirement from the game of baseball after 15 seasons in a piece on the Players’ Tribune, in which he illustrates what he has cherished and learned from playing the sport. "I feel so blessed to have been able to play with and also face some of this game’s greatest players over the last 15 years," Zito wrote. "Experiencing the highest levels of the sport I fell in love with as a kid was a dream come true." Zito posted a 165-143 record as a member of the Oakland A’s from 2000 to 2006 and the San Francisco Giants from 2007 to 2013, logging a 4.04 ERA and 1,885 strikeouts in 2,576.2 innings. He rejoined the A’s for his final season, and on the season’s final Saturday, he participated in a nostalgic start against former A’s "Big Three" teammate Tim Hudson, who also made 2015 his last season in MLB. Zito dazzled during his debut season in 2000, posting a 7-4 record with a 2.72 ERA in 14 starts and finishing sixth in the AL Rookie of the Year voting. Two years later, in his second full season in the majors, Zito took home the AL Cy Young Award with a spectacular 23-5 season with a 2.75 ERA in 2002. After seven seasons with the A’s, Zito was signed by the Giants as a free agent in December 2006. His days in San Francisco were mainly filled with disappointment and angst, as he grappled with high expectations. He finished his Giants career with a 63-80 record and a 4.62 ERA. "More than any dollar earned or trophy standing on my shelf, I can thank this game for the life lessons it taught me about enduring pain and struggle and where to turn when I face adversity again," Zito wrote. "Every single fan out there in the Bay Area played a vital role in my journey, whether it was the cheering fans or the booers. In sports, these two opposites go hand in hand." Now that his time in baseball has officially come to a close, Zito says he’ll pursue a career in music. "Today, I am very excited to be a ‘rookie’ all over again in a new field: songwriting. I am sure the lessons baseball has taught me will help me develop the thick skin I’ll need for this new endeavor."